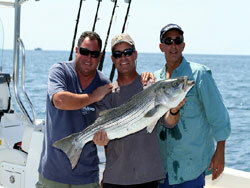 For striped bass rip fishing we recommend a spinning rod and reel combo suitable for 30lb fused line. The optimal rod is 6’6″ to 7′ feet long with a fast to extra-fast action and capable of handling lure weights up to 1 ounce. This is a very versatile spinning outfit and is perfect for dropping the artificial squids to stripers that are holding back in the rips. We recommend loading the reel with 30lb fused line as opposed to braided line or mono. Fused and braided lines allow for much greater casting distance than mono. This is because is the much smaller line diameter of fused and braided lines. In addition, the fused and braided lines have virtually no stretch which allows the angler to precisely work the squid, feel the softest hits, and easily set the hook. Fused line is preferred to braided line because it has better abrasion resistance and is less likely to form a wind knot. The line should be attached to a 3-4ft length of 30-50lb fluorocarbon leader using a 75lb barrel swivel. 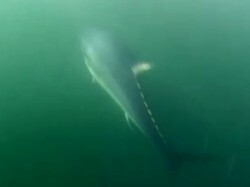 A 50lb leader is certainly preferred when they are bluefish around. The small profile of the swivel virtually eliminates any chance of picking up debris and provides an easy connection point between the line and the leader. 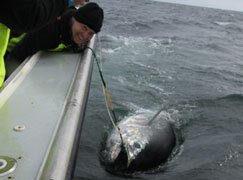 The angler needs to be careful not to reel the swivel into the rod as it can damage the guides. 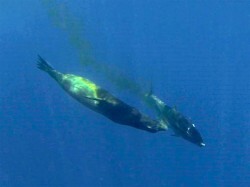 Some anglers use an albright or uni-knot instead of a swivel. This knot can be tricky to tie properly with braided and fused lines. The rig we recommend consists of either a 4-6″ hollow shell squid with a small egg sinker inserted inside and a 3/0 treble trailer hook or a 3″ Berkley Gulp Squid which is available in many colors, has excellent scent and is very tough to pull of the hook. The Gulp squid requires no refrigeration to stay fresh. It should be rigged 4ft behind an egg sinker that is placed above the swivel and rigged with a single 7/0 beak baitholder hook in the mantle. We always use a fish flipper or release tool. The 3-4ft leader is just long enough for the angler to get a couple of wraps on their arm to control the fish while it is still in the water. 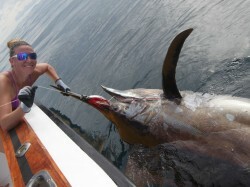 The release tool is used to quickly remove the hooks without exposing the angler to them. It also minimizes any harm or stress to the fish.